So I admit wholeheartedly that I will probably NEVER enjoy running in cold weather, and yesterday my freezing was a chilly 50 degrees. For many of you, my definition of cold weather is anything below 60 degrees. I know my cold and real COLD weather are much different, that’s why I picked out this special gift for all you snow bird runners. I applaud you in all aspects and this gift is suppose to help you out in your freezing weather! Keep up the training and I’ll keep drinking hot chocolate. How ridiculous are these things?! Called Microspikes, they are lightweight and economical, and are a pocket-sized traction system that stands up to slippery terrain. Claiming to be grippy and durable, this slip-on traction system features strategically placed stainless steel spikes connected to a dynamic flex-chain with a tough elastomer shoe harness. The unique “microspike” chain adjusts itself to grip nearly any surface — from ice and packed snow to wet rocks, concrete, and scree. (Honestly I don’t even know what scree is, but it sounds dangerous!) Extremely durable, MICROspikes require no special buckles or straps. This pocket-sized traction device is the answer for people of all ages who want to stay active in the winter with convenient, effective foot traction. 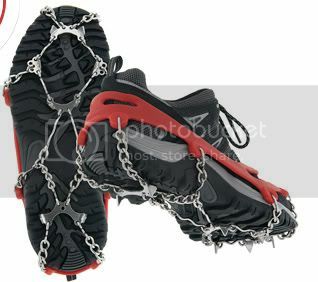 There are another version of these also called YAKTRAX! I never knew these things existed, but anyways, they claim to have a unique, spikeless, patented coil design, unlike other products on the market. (ahem microspikes, ha ha) The Yaktrax Pro will instantly give you better traction, confidence and safety on packed snow or ice. Move about naturally with the same solid grip that you are accustomed to on dry surfaces. Walk or run as you normally would and experience stability on ice and snow like you have never felt before. They are made with high strength, abrasion resistant 1.4 mm steel coils and heavy duty natural rubber material, the Yaktrax Pro easily conforms to the shape of your boot or shoe. With its patented SkidLock coil design, the Yaktrax Pro provides 360 degrees of traction on packed snow and ice and can be worn in temperatures as low as -41° Fahrenheit. They are also ‘easy on/off’, spikeless, and can help reduce the risk of falls and injuries. They are $29.95 and can be found here! So for all you snowbirds, these gifts are specifically for you! Tomorrow morning is the 5k, so I’ll post the gift of the day before that and have a mini race report and a confession to make on Monday! EEK!